Planning a party for adults can be a lot of fun; however, finding games that will entertain everyone can be tricky. Play indoor games to keep your guests from getting bored. These games will also break the ice for any new guests that do not know each other. Play these indoor games at your next adult party. All you will need for this game is pen, paper and movie knowledge. 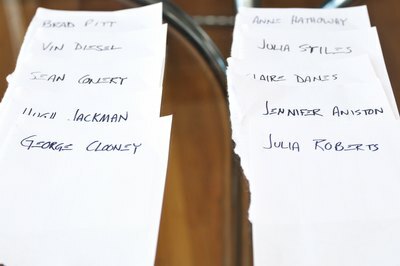 Make a list of five actors and five actresses before the party starts. Give each player a piece of paper and a pen. Set a time limit such as one minute for each actor/actress. The host will say an actor’s name and the guests will have one minute to write down as many movies as they can think of that he played in. Do the same for actresses. At the end of the game, each adult will get a point for each correct answer. The adult with the most points wins the game. Divide players into two even teams and mark the start line. The start line should be about 20 feet away from the balloon pile. Inflate two bags of balloons in different colors, one color for each team. There should be one balloon for each player. 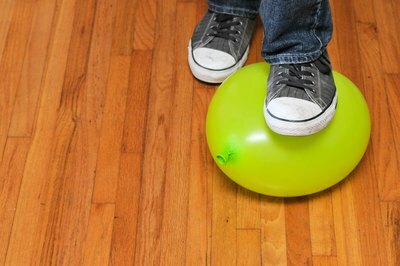 When the host says, “Go,” the first two players (one from each team) will run to the balloon pile and grab his team color and pop the balloon by using his hands, feet or bottom. Once he pops the balloon, he will run back to his team and tag the next person in line. She will run to the balloon pile, pop her team color balloon, and tag the next person in line until all the team balloons are popped. The first team to pop all of their balloons wins the game. You will need a bag of cotton balls, a spoon, a blindfold, a small bowl and a large bowl for this game. Each player will try and scoop as many cotton balls from one bowl to another while blindfolded, using a spoon. Blindfold the first player and have him sit in a chair. Place a small bowl of cotton balls in his lap and a large, empty bowl on his head, which he can hold or you can hold. The object of this game is for each player to try to scoop as many cotton balls as possible into the large bowl, using only the spoon. The player will be blindfolded and cannot use their hands to try to feel the cotton balls. Set a time limit of one minute for each player, and the player that transfers the most cotton balls to the large bowl wins the game.